Please visit Professor Mitsugi's KU website, for additional information. 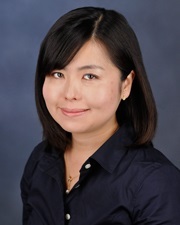 Sanako Mitsugi is AssociateProfessor of Japanese in the Department of East Asian Languages and Cultures, where she also serves as the Japanese language program coordinator. She is interested in the cognitive mechanisms that underlie second language processing. More specifically, her work examines the contributions of factors including high order relationships across sentences, the ability to generate predictions in language, and language experience. In order to examine these issues, she uses psycholinguistic experimentation, such as eye-tracking methodology. Her articles have appeared in various journals such as Applied Psycholinguistics, Bilingualism: Language and Cognition, and International Journal of Bilingualism. Recent grants she has received include Language Learning research grant, ACTFL research priority award, and Japan Foundation pedagogical grant. Mitsugi, S. (2018). Generating predictions based on semantic categories in second language: A case of numeral classifiers in Japanese. International Review of Applied Linguistics in Language Teaching, Online Advanced Publication. Mitsugi, S. (2017). Incremental comprehension of Japanese passives: Evidence from the visual-world paradigm. Applied Psycholinguistics, 38, 953-983. Mitsugi, S. (2016b). Proficiency influences orthographic activations during L2 spoken-word recognition. International Journal of Bilingualism. Advanced Online Publication. Mitsugi, S. & MacWhinney, B. (2016). The use of case marking for predictive processing in second language Japanese. Bilingualism: Language and Cognition, 19, 19-35. Mitsugi, S. (2016a). A Usage-based approach to relativization: an investigation of advanced-learners’ written production of relative clauses in Japanese. In K. Kabata & K. Toratani (Eds. ), Studies on Language Acquisition Series. Cognitive-Functional Approaches to the Study of Japanese as a Second Language (pp.113–136). Walter de Gruter. Mitsugi, S., & Shirai, Y. (2015). L1-L2 asymmetry of the animacy effect in the processing of Japanese relative clauses. Journal of Japanese Linguistics, 31, 5-32.